First things first, click on the image to enlarge so you can see all the wonderful detail. 1920's, Patou, Schiaparelli, Paris, beach pajamas and swimwear? I should say so. Illustrations by Helene Piton. 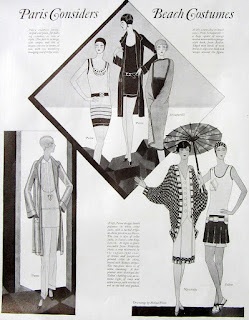 This page is from June 1928, a fashion illustration from a Ladies Home Journal magazine and features some fabulous designers of my favorite subject matter, swimwear, or in this case 'Beach Costumes'. The top illustration shows two Patou pieces, the left and center. Made of striped and plain jersey, in beige and brown stripes and red respectively. The right is from Schiaparelli, and orange woolen sponge backed cape that slips over the head and wraps the body. The bottom left image is of a Patou white crepe satin beach pajamas with a coordinating red satin crepe coat. And finally at right, a sports ensemble from Nowitzky and a box plaited skirted bathing suit from Talbot. You can purchase this page of images from For the Love of Old on ETSY. I'm tempted, so very tempted. Love the drawings from this era, very nice ad. I love that the Patou beach pajamas look almost like trousers.